Simple Caravan Insurance offers Touring Caravan Insurance and Static Caravan Insurance at a price that others will find hard to beat. Price-Beating - We're constantly comparing ourselves against the market to make sure that our customers are able to enjoy the peace of mind at a price that won't break the bank. Comprehensive Cover - Simple offers 3 levels of cover that you can tailor to get the caravan insurance policy that best suits your circumstances. Quick and Easy - You can get an online caravan insurance quote in just 2 minutes and it takes a few minutes more to buy a policy online, which you can do anytime. Trusted - Simple Caravan Insurance is arranged by TPS (Insurance Admin Services) Limited which was established in 1989 and in that time has insured and assited millions of customers. 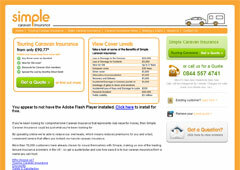 Get a quick and easy quote from Simple Caravan Insurance today and see how much you could save.